A mature student is using his Hollywood and UK Film expertise to improve public health communications. Mark Grindle has completed a PhD from the School of Health Sciences, his third degree from the University of Stirling over 30 years. English-born Mark previously graduated with degrees in Film and Media and Film Production - punctuated by stints working in Hollywood and the UK Film, television and computer games industry – before returning to his favourite alma-mater. Mark began studies at Stirling in 1985, graduating with a First Class degree in Film and Media Studies. During his first degree, he spent a year at the University of California in San Diego before taking on a film editor role with BBC’s Pebble Mill after graduating. 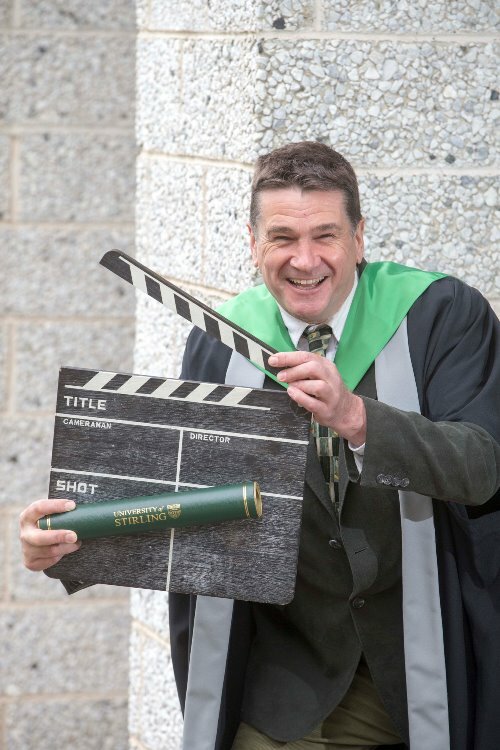 In 1990, he became first recipient of Stirling’s David Jacobs Scholarship, which enabled students to study and research in Hollywood before returning to benefit the Scottish Film and Television industry. After a career working as a screenwriter, script editor, producer and executive producer on programmes such as The Bill, Doctor Finlay and High Road, Mark’s latest degree, coupled with his role as a Scriptwriter and Research Fellow at the University, has seen him use his media industry skills to improve the nation’s health. He has investigated how using interactive digital storytelling - in which users create, direct or influence a film’s storyline in real-time - can improve communications on public health issues such as smoking, alcohol consumption and obesity. Mark said: “I’d lost a parent to cancer so there was a personal element to it, but I also felt that public health information films seemed to be quite patronising. I was exploring interactive storytelling and I thought there were great opportunities to use it the context of health improvement." Read Mark's full story and more from graduates at our 2015 Summer ceremonies at Graduation Live. Mark wrote the screenplay for the family movie The Princess' Stallion. He also 'Bunja' an interactive adventure series set in Borneo rainforest, designed to motivate 9-11 year olds to embrace mathematics concepts and skills. Photo should be credited to Jeff Holmes.